A sixth-former from Saltford has earned the honour of joining an elite group of Army Cadets who will represent the organisation at official engagements in the Bristol area. 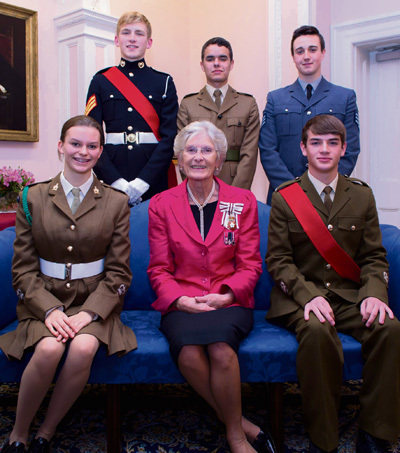 Seventeen-year-old Daniel Phillpotts, a Cadet Company Sergeant Major, has been appointed as one of the County and City of Bristol Lord-Lieutenant’s Cadets for the next year. The role will see the Wellsway student attend a range of important occasions, including any royal visits during the year. of Edinburgh’s Award and is now working towards one highest levels, the Master Cadet Award, besides studying for his A levels. He has a black belt in karate and one day hopes to join the Marines. He said: “I joined the Cadets as soon as I was old enough and it has been a brilliant experience, with plenty of variety, including more recently an advanced infantry course with 6th Battalion, The Rifles, and a Cadet leadership course with the Parachute Regiment. Daniel has taken up his new role alongside four other young people from the Bristol area. A spokesperson for the Keynsham ACF detachment said: “Daniel is an exceptional example of an Army Cadet and relishes every opportunity that comes his way. His enthusiasm for cadet activities, whether they be adventurous training such as abseiling, sailing, etc or activities geared around our military skills syllabus is infectious to those around him. Anyone interested in joining Keynsham Detachment can visit on Thursday evenings between 7.15pm and 9.15pm at the TA Centre, Ashmead Road, Keynsham to find out more about the activities on offer. Contact Bristol ACF Headquarters 0117 986 3344 for more details.